Thank you! I love her. The phones have come pretty far, but if you know what you are doing (even a little like me), real cameras still take the best shots. For what it's worth, half the photos I have up are spur of the moment from my iPhone. . I thought about black, but had her out, and was excited to try out the lens AND she was holding still! Need to be really still for a macro lens to work especially in lower light. Very still, tripod, etc. I'll try to do some with a better background soon! As far as the feeding, I feed my boas based off of age, if that's known. All meals leave little to no bulge, and if they leave a larger bulge than I like, I either wait an extra 1-2 weeks or skip a feeding day, and then offer their usual size. Birth - 1 year get fed every 10-14 days. 1 year olds get fed 14+ days. 2 year olds get fed every 2-3 weeks. 3+ year olds get fed every 4-6 weeks, though most of mine don't go any longer than 5 weeks. I also begin reducing feeds during the winter at the 1.5 year mark, and fasts at the 2.5 year mark. If I decide they aren't ready for fasting one winter, I'll just reduce feeding or feed normally through the winter. I also drop temps slightly if I fast, but not if I just reduce feedings. If I reduce feedings, that's half as often for about 4 months, if I fast that's a temp drop with no food for 3 months. All mice get fed every 10-14 days. They're generally off of mice around the 1.5-2 year mark. Weaned rats get fed every 2-3 weeks. They're generally on weaned rats from 1.5-2.5 years old. Small rats get fed every 3 weeks. They're usually on smalls from 2.5+ years. Mediums get fed every 4 weeks. Larges and 1/2 lb rabbits get fed every 4-6 weeks. 1 lb rabbits get fed every 6-8 weeks. 2 lb rabbits get fed every 8-10 weeks. 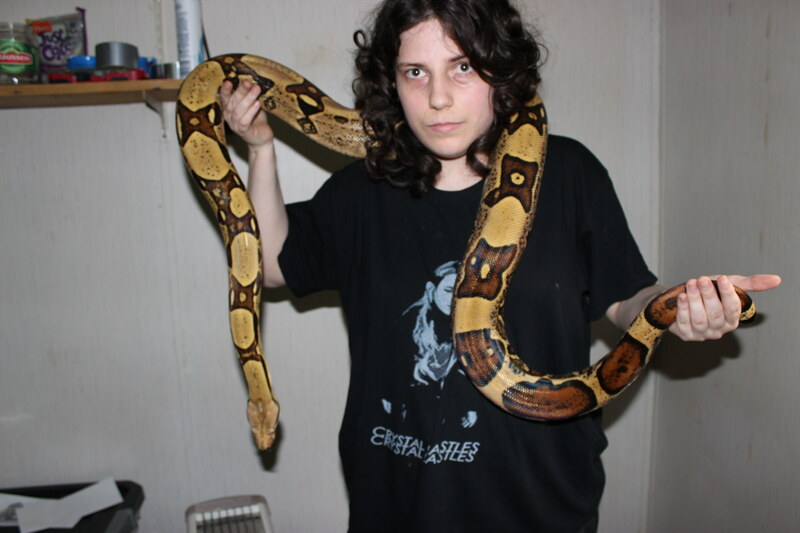 That said, none of my boas have gotten big enough to eat anything larger than a large rat or 1/2 lb rabbit, my biggest is 7'. A lot of people I see give boas that size 2-3 lb rabbits, but imo that's just way way too much. I wouldn't feed a 1 lb rabbit to a boa under 8', and I wouldn't feed a 2-pounder to a boa under 9'-10'. Which boas rarely ever get that big. I have a 7 year old male that's 4'2", a 6.5 year old male that's 6.5', and a 9.5 year old female that's around the 7' mark so she likely won't be getting any bigger either. I completely avoid jumbo mice, jumbo or larger rats, Guinea pigs, pigs, and hamsters due to fat content. If you don't have access to rabbits, I would make any rats above a large 1/3 of the diet or less. So feed large-large-jumbo, then back to large-large-jumbo, etc. Just to balance out the fat intake. Do not ever feed the giant rats, they've been known to cause color loss, liver failure, and death quite quickly in boas. Very few suppliers have them, but I believe Rodent Pro does. None of my boas ever get fed weekly (not as a normal part of a healthy boa's diet anyways), imo it's not necessary. Nothing beats a nice DSLR! I like to have a few different ones on hand. I have a T3i I plan on switching out for a newer model later on down the road, and I want to get another Nikon D3200 or later as well, since they capture colors and pictures slightly differently. I like the flash photography better on the Nikons, but Canon takes way better sunlight photos imo. Okay, so I have heard mixed views on feeding larger rats to BCI's when they are appropriate size. If I don't have easy access to rabbits, what should I do when Behira is full grown (obviously not sure how big she will be but the breeder estimated 13-20 pounds, and 6.5-8FT, based on the size of her parents). What's the largest size rat you would feed a BCI (by weight and/or age please - everyone seems to label them differently)? Instead of a 600-700G rat, would you feed two 300G rats instead and still every 3-4 weeks? Or, feed a smaller rat every 2-3 weeks, etc? If feeding two rats, do they take willingly? The only snake species I have experience feeding multiple food items at once (in one feeding) is very young corn snakes. They are garbage disposals. I thought when Behira was a big girl that I would feed appropriate sized rats every 3-5 weeks. However, I have heard several times now, that really large rats are not good for BCI's because of fat content. At 15 pounds, Behira would be about 6,800 grams. So a 400-600G rat would make sense, right? However, do not want to feed her something that isn't going to be healthy for her. For what it is worth, I know I have a long time before she's eating anything near that size (she's about 700G now). However, would be good to know and (I think) good for other BCI keepers on here to know too. I usually get from Big Cheese Rodent Factory. I'll feed jumbos but IMO Colossals are too fatty. My dear boy is 21 months old now. The last time he ate was on the 8th of December. He decided to go off food now(winter). He was eating jumbo live rats 400+ grams. I,m not sure if those Jumbos or Colossals. Okay, so up to 400G, or there about, is safe, in your opinion? How big is/are your BCI(s) that eat the jumbos? What is their feeding schedule? Thank you! I appreciate the response. I don't weigh feeders (and never really weighed my snakes until i got back into BPs recently) but yeah, jumbos are about as big as I go for rats. I got a couple XXL when one of my suppliers was out of XL (jumbo) recently and they just seem fatty to me, the boas' defecations were also a bit greasy looking (which is usually from too much fat in the feeder). My boas that eat jumbos are 6-6'5 adults (over 10yrs of age). Usually 1 jumbo every 6 weeks or so (I try to vary it between 4-8 weeks). For my biggest girl who was 8.5' (she passed last year at 28yrs old), she'd take small rabbits but I didn't have a reliable source, so I'd usually give her 2 jumbos. Different things work, there's no 'set' schedule but generally with boas, slower growing is the way to go for good muscle density and long life. I am sorry for your loss last year. 28 years is a great run though. You sound like a great keeper and I am sure you gave her a great life. Yeah. Slow and steady. Behira isn’t even 2 and is eating smaller meals every 2 weeks. I want a happy and healthy girl for a long time! Any adult boa under 8' should easily be able to stay on regular larges for life, without any need for jumbos, colossals, etc. My 7' girl just gets a regular large rat or 1/2 lb rabbit every 4-5 weeks. She's 10-13 lbs. My 6.5' boy is only 8.5-9 lbs, and gets the same size meal, but his rabbits may be as small as 1/4 lb. This is my 7' girl. My larges are in the 150-265 gram range, I buy from both Big Cheese and Perfect Prey as is available. I don't feed rats to my 6'-7' boas that are over maybe 290 grams max. If your boa is 21 months old and already large enough to eat jumbo rats, he's been power fed. My 33 month old boas are 4' or under, and eating small rats. Are you positive about the age? How long have you had him, and how big was he when you got him? As I've mentioned, not even my big 7' girl gets jumbos.